Interested in becoming a beekeeper? Beekeeping can be enjoyed by almost anyone in Tennessee, whether you live on a farm or have nothing more than a backyard for your new hobby. The first step? Find a local beekeeping club. While there are plenty of great books and online resources for prospective beekeepers, the best way to learn the craft is through discussion and observation with experienced beekeepers. 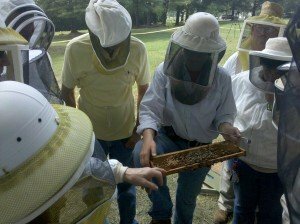 Many local clubs may also offer new beekeeper classes to help get you started. You can read up on beekeeping either in books or online. One resource that is free and highly regarded is Beekeeping in Tennessee. You can download it from the UT website. While you can start learning about beekeeping any time of the year, the spring is the best time to establish new colonies. In Tennessee, new colonies must build up strength and store honey throughout the summer in order to survive the winter months.